Quite a likeliness of what we have been observing in the recent times. When Vijay released the title Puli, Vishal came forward and made his film named Paayum Puli. 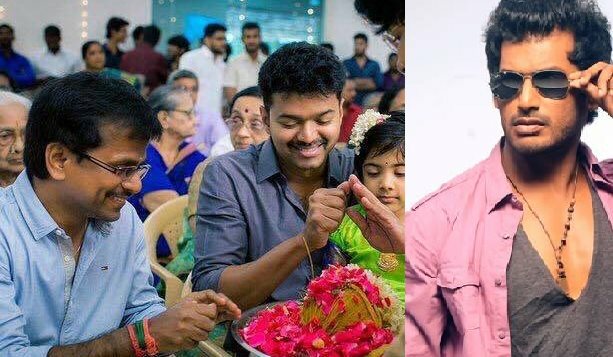 When everyone from the Pandavar Ani made their way to the sets of Vijay 59 for campaigning, Vishal made his absence there. Later it was reported that when Vijay decided to have the audio launch of Puli on a Sunday evening, Vishal hosted the audio launch of Paayum Puli on Sunday morning. Nevertheless, Vishal had made a statement saying that he is planning to direct Ilayathalapathy Vijay as well. But now there seems to be a stunning clash. Yes, AR Murugadoss has penned a strong script involving social issues much alike Thuppakki and Kaththi. Whether it would be allotted to Vijay or Vishal is something we have to wait and watch. It is noteworthy that AR Murugadoss has already narrated a script to Vishal and we shall wait and watch what's gonna happen. Seen PULI MOVIE and its superbly taken and very satisfying to watch; totally FIRST TIME THIS KIND OF VERY PLEASANT (very refreshing) TO WATCH TAMIL MOVIE. Vijay had acted very appropriately well (its always very cool brilliant execution from VIJAY). Also, Sri devi, Shruti Hasan, Hansika & all others had acted brilliantly. I DON'T understand why negative comments, and from whom? LET'S APPRECIATE THESE KIND OF VERY GOOD MOVIES (instead of same old masala movies). Movie goer's opinions: Vishal (BLACK Looking TELUNGU person / origin) MAY be (appears to be) going in the wrong direction of trying to destroy Tamil Movie industry & leading actors (Hon. Sarath Kumar, Hon. Vijay, Hon. Ajit, Hon. Arya &Hon. Rajini Kanth and so on). IT'S POSSIBLE FOR TAMIL AUDIENCE (if they wish) TO STOP POURING MONEY (i.e. buying tickets to his movies) TO WATCH HIS MOVIES. IF he wants fame he "could" go to Telungana state. Cortesy of Census- At the 2001 census, Tamil was spoken by 88.43% of the population followed by Teluguat 5.65%, Kannada at 2.68%, Urdu at 1.51% and Malayalam at 0.59%.